I try to make at least one new pumpkin recipe each year. Last year, I made a lovely pumpkin cake roll based on my grandmother’s traditional sponge cake recipe. And two years ago, I made her amazing Polish Mazurka cookie recipe topped with pumpkin spice caramel. So this year, I used another favorite Paula Peck cookie recipe to make a chocolate chip pumpkin spice version. Now, I’m still not sure how I feel about the pumpkin and chocolate chips together but it seems to be a well-liked combination. Although I’m a major chocolate fanatic, I personally feel that pumpkin and spices have enough going on without a chocolate component and nuts are a better pairing. In hindsight, I would replace the chocolate chips in this recipe with chopped walnuts but this really depends on your preference – it’s hard to go wrong with semi-sweet chocolate chips. I used my grandmother’s recipe for croquet aux filberts as the base for this pumpkin spice cookie. The pumpkin creates a moist texture that is ultimately very different from the original cookie. Although these may look similar to biscotti, they are soft cookies and actually much softer than even what many may consider a true soft biscotti. Still delicious with coffee, these pumpkin spice chocolate chip delights are the best way to start your fall mornings, as well as satisfy that popular pumpkin craving. Preheat oven to 375 degrees and lightly grease or line a baking sheet with parchment paper. Cream butter and a 2/3 cup sugar together. Mix in vanilla and egg. Add pumpkin puree and mix well. In a separate bowl mix together flour, salt, and spices. Gently stir flour into pumpkin mixture. Mix in chocolate chips or walnuts. Form each half into a long, slim loaf about 3 inches wide. Chill 15 minutes. Brush each loaf with egg white mixed with water. Sprinkle with remaining sugar. Bake 30 minutes or until loaves are golden brown. Remove from oven and cool slightly. Reduce oven temperature to 300 degrees. Cut loaves straight or diagonally into 1/2 inch slices. Replace slices in oven for 15 minutes or until they are lightly toasted and dry. Hi Andrea – since this recipe was adapted from the my grandmother’s croquet aux filbert recipe (which did not use powder or soda), I didn’t add it. 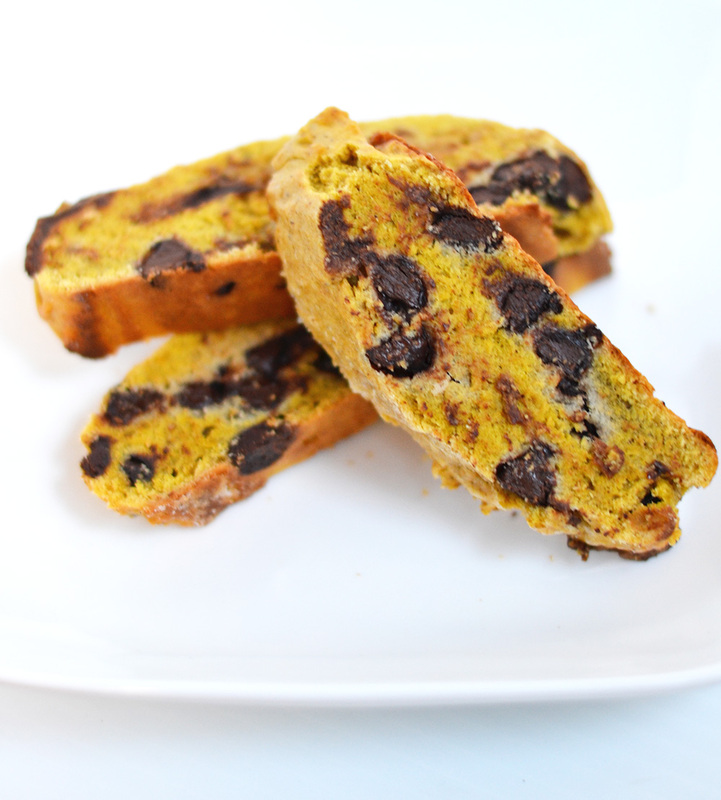 Biscotti’s are normally somewhat dense and crunchy so leavening (from powder or soda) isn’t really necessary. How did they turn out with powder? I would imagine the texture was a bit lighter?